Paulus has – once again – astounded me with a beautifully tragic novel. Her sequel to Swimming Through Clouds follows the healing process of the Vanderbilt siblings as they struggle to flee their history of domestic violence. Talia’s much-awaited story continues as she hides in a safe house for survivors of domestic violence, and Paulus contrasts this with the excitement of the story of heroic Jesse, who searches for his father in the streets of Chicago, thirsty for revenge. I’m not going to lie, when Paulus started the story with a chapter in Jesse’s point of view, I was more than a little cynical, and immediately felt a strong dislike towards his determination to get revenge on his father. However, about two-thirds of the way into the novel, I suddenly realized exactly how connected I felt to Jesse, and how I was empathizing with him even though I have never experienced anything remotely close to what he went through. Somehow, Paulus had managed to subconsciously attach me to Jesse as the story progressed. 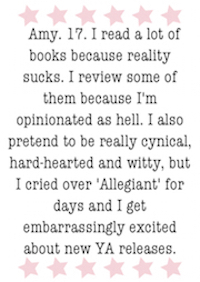 That is good writing at its finest. Another thing that makes me go a little gooey inside is Talia and Lagan’s relationship. Usually, I despise perfect, overly cute and fluffy love stories, and yet somehow Paulus managed to make me fall in love with the way Talia and Lagan are in love. Despite the numerous times I had to groan at Lagan’s cheesy pick up lines, I had to smile just as often at the way their love story was beautifully unconventional. And I think Rajdeep Paulus should get a prize for inventing the most adorable relationship that manages to avoid the clichés constantly presented in romantic comedies that our society has grown to love. Paulus’ seemingly effortless knack for comparisons made a serious impression on me as well. There were times when I had to pause for a moment so that I could think about their sheer genius before I carried on reading. Not only does each and every metaphor make complete logical sense, but they are also impressively unique and poetic. I’ll admit, there were times where I started to find the story a little dull and repetitive, but as soon as I started to get bored, suddenly another climax would jerk me out of my daydreams and I would be caught up in a whirlwind of emotions once again. 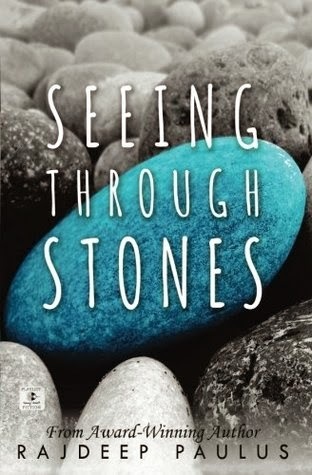 Let me also just point out that it is not a good idea to read the last few chapters of Seeing Through Stones in public, because the amount of times I gasped, squealed, bolted upright, and protested loudly against some of the events that occurred was enough to make my family later admit they didn’t want to be seen with me in public any more (let it also be known that I was inside my house at this point – so ensure you are in a soundproofed room as well). Overall, this was another stunning and breathtaking novel from Rajdeep Paulus, and one that I highly recommend reading.